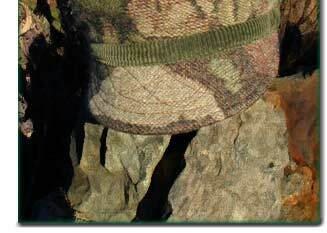 Hat People offers our Pendleton Camouflage Blanket Wool Cap in two color patterns ~ one is best described as a Fir Tree Camo and the second ~ Oak Tree Camo. You can click on the two pattern names and see images of the actual blankets. Please bear in mind that these Camo Blankets are 60" wide and the pictures I show include most of the width of the blanket. A single leaf can cover the entire top of a hat. 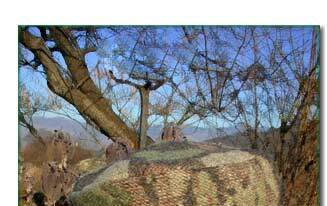 The Fir Tree Camo has greater extremes between dark and light, and a sharper line quality (see the hat pictured). The Oak Tree Camo does not vary as much from light to dark, with the pattern seeming more blended, dominated by leaves. These are Blanket Wool Caps, heavier than most tweeds and very sturdy. You can roll them up and shove them into your pocket and they are washable, by hand, in cold water. Trimmed with a cotton band and lined with cotton flannel; the wool does not touch your head. There may be slight variations in the cotton band, from the hat pictured above. Good rain hats. The best way to determine your size is to measure your head with a cloth sewing tape. More on this subject can be found on our Ordering Information page. We're here at the Hat Ranch most of the time, so if you have any questions please call us during regular business hours, Pacific Standard Time, phone 1(888) 930 4287 or email is good too.